Do Your Goals Mean Anything | Fulcrum ConsultingWorks Inc. In today’s podcast Becky suggests specific tests to verify that your goals contribute something very important to the success of your business. 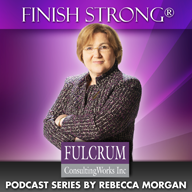 This entry was posted in Podcast Series: Finish Strong® and tagged goals by Becky. Bookmark the permalink.